Trust your techs. They’re really smart. Like every business owner, you’re probably trying to save money. So when your air conditioner is on the fritz or needs a seasonal cleaning, you may be tempted to call in your handy brother-in-law or let your building maintenance guy try to do it himself. It may seem simple to hose off the condenser coils and check the refrigerant level, but HVAC work is much more complex than you may realize. Your service tech has had years of training, he has loads of knowledge that help him both solve and prevent problems, and he’s much smarter than your brother-in-law (don’t tell him we said that). HVAC is a complex trade and you can do a lot of damage and cost yourself a great deal of money by taking shortcuts. You probably know that tackling electrical work is not a DIY project because electricity can be deadly, especially when handled by anyone who doesn’t know what they are doing. HVAC work can be even more dangerous, because fixing air conditioners involves not only high-voltage electricity, but extremely hazardous refrigerant gas. What’s more, the risk is not just to the person doing the work. Building occupants and even the environment can be harmed by a refrigerant leak caused by an unqualified person handling your air conditioner. Refrigerant gases released into the atmosphere are one of the worst culprits in depleting the ozone layer. In addition to the environmental risks, refrigerant can cause breathing problems and even death if released in large amounts into the air. Even small amounts of refrigerant can also cause skin and eye injury if someone is exposed. 2. You can easily damage your system and introduce new problems. If not properly trained, a DIYer can make many mistakes that can damage your air conditioner and make matters worse. For example, even if they can get a hold of a set of gauges, using them incorrectly can get air, oil or dirt into your system. This leads to increased pressure in the system that strains bearings, drive motors, belts and gasket seals, and can ultimately cause compressor failure which is a death sentence for your air conditioner. EPA 608 certification is required by the U.S. Environmental Protection Agency for anyone who handles refrigerant when performing air conditioning maintenance and repair services. You can be subject to hefty fines if you’re found to be in violation. 4. The tools alone cost more than the price of the job. The tools used by NYC HVAC techs are probably not in your bother-in-law’s toolbox. Things like gauges, meters, specialized vacuum pumps that are needed to accurately diagnose and fix problems with your air conditioner will very likely set you back more than it would cost to bring in a professional. And if the problem turns out to be a low refrigerant charge, you can’t even buy the refrigerant gas without a license. 5. You will void your equipment warranty. Equipment manufacturers are explicit about this in their warranties. If you ever need to replace a part that’s under warranty, and the authorized service company finds any sign that your air conditioner was worked on by someone unauthorized and unqualified, the manufacturer will not honor the warranty. You may think you’re saving money in the short term, but you’ll pay through the nose in the long run. 6. You’ll miss the chance to prevent an impending failure. Trained NYC HVAC techs are often able to prevent problems because big issues often start with small ones. When an experienced professional maintains your air conditioner, he knows the signs of impending trouble. When he spots one, he can replace a part that prevents your system from breaking down altogether. You’ll pay a small repair bill instead of having to buy a new air conditioner. 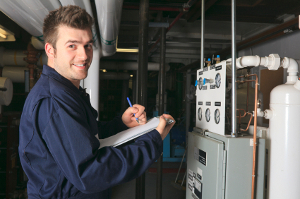 HVAC techs are in high demand for a reason. Certified air conditioning and heating service technicians undergo years of training, years of apprenticeship service, and must pass a rigorous certification exam. It’s much more than just connecting pipes and wires. There’s a tremendous amount of knowledge, experience and problem-solving skills that are required to do the job well. Certified technicians have experience handling all the necessary equipment, including safety interlocks and disconnects that prevent refrigerant leaks, as well as tools needed to correctly diagnose and fix your problem before it causes a much worse failure and larger expense. So don’t be tempted to go the DIY route with your air conditioner; it’s just not worth the risk. Establishing a relationship with a reputable air conditioning service company is the best thing to do for the longevity of your system, not to mention your wallet. The time is now! Save $$ this summer. Here at Cottam HVAC we believe it’s everyone’s responsibility to help conserve energy – whether you’re a homeowner or renter. The big question is how to make changes that will have a real impact on the energy use in your home. The good news is that there are many simple, easy-to-do projects that nearly any homeowner can handle. If you don’t feel comfortable tackling these projects yourself, you can always hire a handyman to help or scroll YouTube for ways to do some of the following projects. 1. Replace traditional light bulbs: Using energy efficient light bulbs such as LED or fluorescent bulbs might be more expensive, but they can last up to 10 times longer than conventional bulbs. 2. Replace an old shower head: Replacing an old shower head with a new energy-saving, low flow one can save lots of money on your next water bill. 3. Install Ground Fault Circuit Interrupters (GFCI’s): Identify electrical outlets near kitchen or bathroom sinks and replace them with GFCI’s to protect your family from possible electrical shocks. 4. Install high-efficiency faucet aerators: These work as simple efficiency additions for your kitchen and bathroom sinks. Generally cheaper than $20, these small devices can make a big difference without hurting your wallet. 5. Install pipe insulation: Adding pipe insulation to your hot water pipes to help conserve heat. 6. Do an energy audit of your home: When doing this, look for areas where heating or AC may be leaking out and seal it with caulk or weather stripping to prevent energy loss. 8. Insulate properly: Wrap your water heater (if it’s older) in an insulation blanket can save you both energy and money.